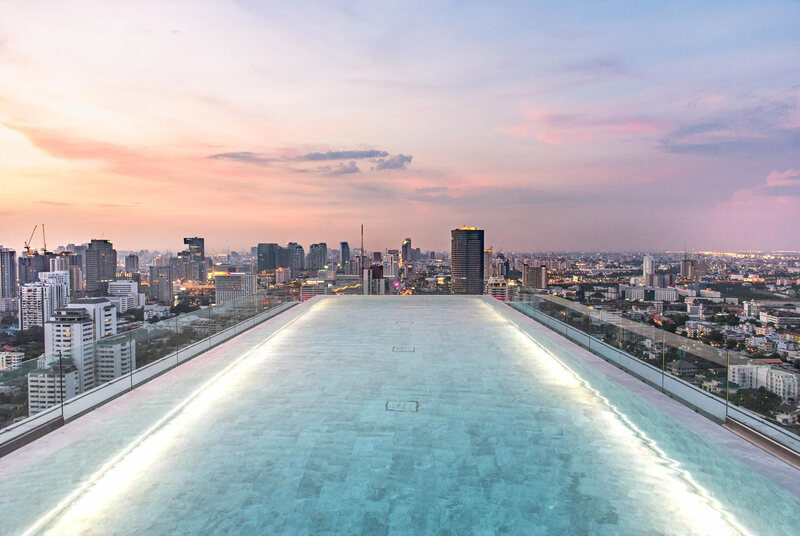 34 luxurious suites named after the great royal periods in Thai history, the Rattanakosin Suites, The Ayuthaya Suites, the Sukhothai Suites, and the Thonburi Suites. Private dining in each suite replete with Maxi Bars & private wine cellars, large balconies, expansive ensuite bathroom with large round bath and walk in wardrobes – add to this private butler and you have an executive home in Bangkok without compare. Services include Baan Borneo Club, the Wellness & Lifestyle Spa & Meditation Sala, the Nimitr Fine Dining Restaurant, the Sky Bar infinity pool and the Jack Bain’s Bar and Cigar Divan. Limousines and tuk tuks – with wireless no less enable you to communicate with friends or business associates at every moment. Set in the heart of Bangkok’s upscale Emquartier & Emporium Shopping area and in the heart of fashionable Thonglor district of Bangkok, you are well located for business or pleasure.